NFPA 101®: Life Safety Code® and its fully updated Handbook provide answers and Code support, so you can work smarter to safeguard lives in any building. Avoid errors and save 15% with the 2018 edition NFPA 101 Code and Handbook Set! Bring your Code knowledge up-to-date so you can protect people from fire and related hazards, pass inspections, and keep projects on schedule in new and existing occupancies. Whether you're a building owner, architect, designer, contractor, engineer, AHJ, or inspector, NFPA 101: Life Safety Code and its companion Handbook are the most critical resources for safety in the build environment. As building technologies advance and risks evolve, this money-saving Set from NFPA® helps ensure you're prepared. Work with the combined power of the NFPA 101 and Handbook Set. Make sure you understand and are able to apply the Life Safety Code effectively in any environment. Get the best value on essential tools that help you protect lives, stay competitive, and avoid dangerous and costly Code violations. Provide occupant safety using the latest requirements plus key insights in the 2015 NFPA 101® and Handbook Set. As the built environment and risks evolve, so do the challenges to protect people from fire and related hazards. Bring your knowledge up-to-date so you can safeguard lives, pass inspections, and keep projects on schedule. 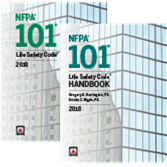 Whether you're a building owner, architect, designer, contractor, engineer, AHJ, or inspector, insist on the 2015 edition of the NFPA 101: Life Safety Code® and Handbook Set. Save time and money, and safeguard lives with the combined power of the NFPA 101 and Handbook Set. Make a smooth transition to the new 2015 Life Safety Code rules. Order this powerhouse Set for your best value on essential tools that help you protect lives, stay competitive, and avoid violations. Be fully prepared for compliance right from the start! Get the latest requirements plus insights and answers to help you apply them correctly in the 2012 NFPA 101® and Handbook Set. The rules for occupant safety have changed! And because even a seemingly minor violation can have major consequences, it's essential to make sure your knowledge measures up so you can safeguard lives, pass inspections, and keep projects on schedule. The best way to do that is by working with the 2012 NFPA 101: Life Safety Code® and Handbook Set. Work smart! Save time, money, and lives with the combined power of the NFPA 101 and Handbook Set. Make a smooth transition to the 2012 Life Safety Code rules. Order this powerhouse Set for your best value on essential tools that help you protect lives, stay competitive, and avoid violations.